Transnistria (Romanian: [transˈnistria]), officially the Pridnestrovian Moldavian Republic (PMR; Russian: Приднестровская Молдавская Республика; Romanian: Republica Moldovenească Nistreană, RMN; Moldovan: Република Молдовеняскэ Нистрянэ; Ukrainian: Придністровська Молдавська Республіка), and also called Transdniester, Trans-Dniestr, Transdniestria, or Pridnestrovie, is a landlocked self-proclaimed state situated between Ukraine and the River Dniester, recognised only by three other non-United Nations (UN) states: Abkhazia, Nagorno-Karabakh and South Ossetia. The region is considered by the UN to be part of Moldova. The PMR controls a narrow strip of territory to the east of the River Dniester, and also the city of Bender and its surrounding localities on the west bank, in the historical region of Bessarabia. Unrecognised by any United Nations member state, Transnistria is designated by the Republic of Moldova as the Transnistria autonomous territorial unit with special legal status (Romanian: Unitatea teritorială autonomă cu statut juridic special Transnistria), or Stînga Nistrului ("Left Bank of the Dniester"). Transnistria, Nagorno-Karabakh, Abkhazia, and South Ossetia are post-Soviet "frozen conflict" zones. These four partially recognised states maintain friendly relations with each other and form the Community for Democracy and Rights of Nations. The region is also known in English as "Trans-Dniestr" or "Transdniestria". Etymologically, these names are adaptations of the Romanian colloquial name of the region, "Transnistria" meaning "beyond the River Dniester". The documents of the government of Moldova refer to the region as Stînga Nistrului (in full, Unitățile Administrativ-Teritoriale din Stînga Nistrului) meaning "Left Bank of the Dniester" (in full, "Administrative-territorial unit(s) of the Left Bank of the Dniester"). The name of the region according to the Transnistrian authorities is Pridnestrovian Moldavian Republic (PMR) (Russian: Приднестровская Молдавская Республика, ПМР, Pridnestrovskaya Moldavskaya Respublika; Moldovan Cyrillic alphabet: Република Молдовеняскэ Нистрянэ, РМН, Romanian: Republica Moldovenească Nistreană; Ukrainian: Придністровська Молдавська Республіка, ПМР, Prydnistrovs'ka Moldavs'ka Respublika). The short form of this name is Pridnestrovie (Russian: Приднестровье, Pridnestrovye; Moldovan Cyrillic alphabet: Нистрения, Nistrenia; Ukrainian: Придністров'я, Prydnistrovya). "Pridnestrovie" is a transliteration of the Russian "Приднестровье" meaning "[a land] by the [River] Dniester". Indo-European tribes had for millennia inhabited the area where Transnistria now is when it was a borderland between Dacia and Scythia. The Tyragetae (a Getae Thracian tribe) inhabited the area around the River Dniester (called "Tyras" in ancient documents) as well as the Scythians. Early Germanic and Turkic tribes were present in the area during their attacks and invasions of the Roman Empire. From 56 AD, the coastal area around the city of Tyras was occupied by the Romans for nearly four centuries, forming part of the province of Lower Moesia. Tyras enjoyed great development during Roman times: there is a series of its coins with heads of emperors from Domitian to Alexander Severus. But in the second half of the fourth century the area was continuously attacked by barbarians and the Roman legionaries left Tyras. In the early Middle Ages, Slavic tribes of Tivertsi and Ulichs populated larger areas, including Transnistria, followed by Turkic nomads such as the Petchenegs and Cumans. Possibly an early part of Kievan Rus', after the Mongol invasion of Europe in 1241, the territory was briefly under Mongol control (yet probably without any permanent settlements) and later under the Crimean Khanate. From the 15th century, northern Transnistria (current districts of Camenca and Rîbniţa) were part of the Grand Duchy of Lithuania, and later to the Polish–Lithuanian Commonwealth (1569–1793) which encouraged the migration of peasants into the territory from the neighbouring populated areas (from north and from west). Prince of Moldavia George Ducas (1665–66, 1668–72, 1678–84) built a court at Țicanova on the east bank of the Dniester, and one at Nimirov on the Southern Bug, last mentioned in Moldavian hands in 1765. The localities Dubăsari, Rașcov, Vasilcău, as well as four other currently in Ukraine are mentioned in 17th–18th centuries as fairs for the Dniester-Bug region. In 1769, a document dated at Bender mentions the then title of the Mitropolitan of Moldavia as Mitropolitan of Proilavia, of Tamarova, of Hotin, and of all the borders of the Danube, of the Dniester, and the Han's Ukraine, the latter being a common reference to the then sparsely populated Dniester–Southern Bug–Dniepr area. Before becoming part of the Russian Empire in 1792 (southern part) and 1793 (northern part) the largest groups living between the Dniester and the Bug rivers were Moldavian, Ruthenian (Ukrainian) and Tatar peasants. The Russian census of 1793 of the Ochakov region (southern part of the Dniester-Bug area) mentions a totality of 67 villages, of which 49 are mentioned as Moldavian and 18 as Tatar. The first candidate for the governor of the new Russian region was the Moldavian boyar of Greek ancestry Alexandru I. Mavrocordat. The northern part of Transnistria had Ruthenian (Ukrainian) and Moldavian villages. In 1792, the region became part of the Russian Empire as a result of the sixth Russo-Turkish War. In that year, the general Alexander Suvorov founded modern Tiraspol as a Russian border fortress. Until the Russian Revolution of 1917, the current Transnistria was divided among the imperial guberniyas of Podolia, Kherson, and Bessarabia. Most of the territory which now is Transnistria was part of the larger New Russia region, hence it saw a strong colonisation process, with a multitude of ethnicities being settled: lands were given to enserfed peasantry from Russia and Ukraine in Nova Serbia, while Jews and Germans were brought in to facilitate economic development. Transnistria became an autonomous political entity in 1924 with the proclamation of the Moldavian ASSR, which included today's Transnistria (4,000 km2) and an adjacent area (9,000 km2) around the city of Balta in modern-day Ukraine, but nothing from Bessarabia, which at the time formed part of Romania. One of the reasons for the creation of the Moldavian ASSR was the desire of the Soviet Union at the time to eventually incorporate Bessarabia. The Moldavian SSR, organised by a decision of the Supreme Soviet of the USSR on 2 August 1940, was formed out of a part of Bessarabia (taken from Romania on 28 June, after the Molotov–Ribbentrop Pact) and out of a part of the Moldavian ASSR roughly equivalent to present-day Transnistria. In 1941, after Axis forces invaded the Soviet Union during the Second World War, they defeated the Soviet troops in the region and occupied it. Romania controlled the entire region between Dniester and Southern Bug rivers, including the city of Odessa as local capital. The Romanian-administered territory – called the Transnistria Governorate – with an area of 44,000 km2 and a population of 2.3 million inhabitants, was divided into 13 counties: Ananiev, Balta, Berzovca, Dubasari, Golta, Jugastru, Movilau, Oceacov, Odessa, Ovidiopol, Rîbnița, Tiraspol and Tulcin. This enlarged Transnistria was home to nearly 200,000 Romanian/Moldovan-speaking residents. The Romanian administration of Transnistria attempted to stabilise the situation in the area under Romanian control, implementing a process of Romanianization. During the Romanian occupation of 1941–44, between 150,000 and 250,000 Ukrainian and Romanian Jews had been deported to Transnistria and the majority were executed or died from other causes in ghettos and concentration camps of the Governorate. After the Red Army reconquered the area in 1944, Soviet authorities executed, exiled or imprisoned hundreds of the Moldavian SSR inhabitants in the following months on charges of collaboration with the "German-fascist occupiers". A later campaign was directed against the rich peasant families, who were deported to Kazakhstan and Siberia. Over the course of two days, 6–7 July 1949, a plan named "Operation South" saw the deportation of over 11,342 families by the order of the Moldovian Minister of State Security, I. L. Mordovets. In the 1980s, Mikhail Gorbachev's policies of perestroika and glasnost in the Soviet Union allowed political liberalisation at a regional level. This led to the creation of various informal movements all over the country, and to a rise of nationalism within most Soviet republics. In the Moldavian SSR in particular, there was a significant resurgence of pro-Romanian nationalism among ethnic Moldovans. The most prominent of these movements was the Popular Front of Moldova. 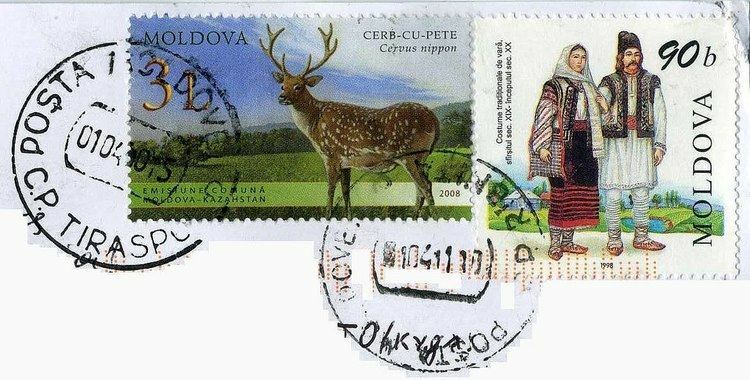 In the spring of 1988, PFM demanded that the Soviet authorities declare Moldovan the only state language, return to the use of the Latin alphabet, and recognise the shared ethnic identity of Moldovans and Romanians. The more radical factions of the Popular Front espoused extreme anti-minority, ethnocentric and chauvinist positions, calling for minority populations, particularly the Slavs (mainly Russians and Ukrainians) and Gagauz, to leave or be expelled from Moldova. On 31 August 1989, the Supreme Council of the Moldavian SSR adopted Moldovan as the only official language with Russian retained only for secondary purposes, returned Moldovan to the Latin alphabet, and declared a shared Moldovan-Romanian linguistic identity. As plans for major cultural changes in Moldova were made public, tensions rose further. Ethnic minorities felt threatened by the prospects of removing Russian as the official language, which served as the medium of interethnic communication, and by the possible future reunification of Moldova and Romania, as well as the ethnocentric rhetoric of the Popular Front. The Yedinstvo (Unity) Movement, established by the Slavic population of Moldova, pressed for equal status to be given to both Russian and Moldovan. Transnistria's ethnic and linguistic composition differed significantly from most of the rest of Moldova. The share of ethnic Russians and Ukrainians was especially high and an overall majority of the population, some of them ethnic Moldovans, spoke Russian as a mother tongue. Ethnic Moldovans accounted for less than 40% of Transnistria's population in 1989. The nationalist Popular Front won the first free parliamentary elections in the Moldavian SSR in the spring of 1990, and its agenda started slowly to be implemented. On 2 September 1990, the Pridnestrovian Moldavian Soviet Socialist Republic was proclaimed as a Soviet republic by an ad hoc assembly, the Second Congress of the Peoples' Representatives of Transnistria. Violence escalated when in October 1990 the Popular Front called for volunteers to form armed militias to stop an autonomy referendum in Gagauzia, which had an even higher share of ethnic minorities. In response, volunteer militias were formed in Transnistria. In April 1990, nationalist mobs attacked ethnic Russian members of parliament, while the Moldovan police refused to intervene or restore order. In the interest of preserving a unified Moldavian SSR within the USSR and preventing the situation escalating further, then Soviet President Mikhail Gorbachev, while citing the restriction of civil rights of ethnic minorities by Moldova as the cause of the dispute, declared the Transnistria proclamation to be lacking legal basis and annulled it by presidential decree on 22 December 1990. Nevertheless, no significant action was taken against Transnistria and the new authorities were slowly able to establish control of the region. The War of Transnistria followed armed clashes on a limited scale which broke out between Transnistrian separatists and Moldova as early as November 1990 at Dubăsari. Volunteers, including Cossacks, came from Russia to help the separatist side. In mid-April 1992, under the agreements on the split of the military equipment of the former Soviet Union negotiated between the former 15 republics in the previous months, Moldova created its own Defence Ministry. According to the decree of its creation, most of the 14th Soviet Army's military equipment was to be retained by Moldova. Starting from 2 March 1992, there was concerted military action between Moldova and Transnistria. Throughout early 1992 the fighting intensified. The former Soviet 14th Guards Army entered the conflict in its final stage, opening fire against Moldovan forces; Approximately 700 people were killed. Since then, Moldova has exercised no effective control or influence on Transnistrian authorities. A ceasefire agreement was signed on 21 July 1992 and has held to the present day. The Organization for Security and Co-operation in Europe (OSCE) is trying to facilitate a negotiated settlement. Under OSCE auspices, on 8 May 1997, the Moldovan President Petru Lucinschi and the Transnistrian president Igor Smirnov, signed the "Memorandum on the principles of normalization of the relations between the Republic of Moldova and Transnistria", also known as the "Primakov Memorandum", sustaining the establishment of legal and state relations, although the memorandum's provisions were interpreted differently by the governments of Moldova and Transnistria. In November 2003, Dmitry Kozak, a counselor of the Russian president Vladimir Putin , proposed a memorandum on the creation of an asymmetric federal Moldovan state, with Moldova holding a majority and Transnistria being a minority part of the federation. Known as "the Kozak memorandum", it did not coincide with the Transnistrian position, which sought equal status between Transnistria and Moldova, but gave Transnistria veto powers over future constitutional changes; this encouraged Transnistria to sign it. Vladimir Voronin was initially supportive of the plan, but refused to sign it after internal opposition and international pressure from the OSCE and US, and after Russia had endorsed the Transnistrian demand to maintain a Russian military presence for the next 20 years as a guarantee for the intended federation. Talks were started in 2006 to deal with the problems, but without results for many years. In February 2011 the so-called "5 + 2 Talks" (thus named because they were carried out by Transnistria, Moldova, Ukraine, Russia and OSCE, plus the US and the EU as external observers) were started again in Vienna. After the annexation of the Crimea by Russia in March 2014 the head of the Transnistrian parliament asked to join the Russian Federation. Transnistria is landlocked and borders Bessarabia (i.e., the rest of Moldova, for 411 km) to the West, and Ukraine (for 405 km) to the East. It is a narrow valley stretching in the North-South direction along the bank of the Dniester river, which forms a natural boundary along most of the border with (the rest of) Moldova. The territory controlled by the PMR is mostly, but not completely, coincident with the left (eastern) bank of Dniester. It includes ten cities and towns, and 69 communes, with a total of 147 localities (counting the unincorporated ones as well). Six communes on the left bank (Cocieri, Molovata Nouă, Corjova, Pîrîta, Coșnița, and Doroțcaia) remained under the control of the Moldovan government after the War of Transnistria in 1992, as part of the Dubăsari District. They are situated north and south of the city of Dubăsari, which itself is under PMR control. The village of Roghi of Molovata Nouă Commune is also controlled by the PMR (Moldova controls the other nine of the ten villages of the six communes). On the west bank, in Bessarabia, the city of Bender and four communes (containing six villages) to its east, south-east, and south, on the opposite bank of the river Dniester from the city of Tiraspol (Proteagailovca, Gîsca, Chițcani, and Cremenciug) are controlled by the PMR. The localities controlled by Moldova on the eastern bank, the village of Roghi, and the city of Dubăsari (situated on the eastern bank and controlled by the PMR) form a security zone along with the six villages and one city controlled by the PMR on the western bank, as well as two (Varnița and Copanca) on the same west bank under Moldovan control. The security situation inside it is subject to the Joint Control Commission rulings. The main transportation route in Transnistria is the road Tiraspol-Dubăsari-Rîbnița. North and south of Dubăsari it passes through the lands of the villages controlled by Moldova (Doroțcaia, Cocieri, Roghi, while Vasilievca is entirely situated east of the road). Conflict erupted on several occasions when the PMR prevented the villagers from reaching their farmland east of the road. Transnistrians are able to travel (normally without difficulty) in and out of the territory under PMR control to neighbouring Moldovan-controlled territory, to Ukraine, and on to Russia, by road or (when service is not interrupted by political tensions) on two international trains, the year-round Moscow-Chișinău, and the seasonal Saratov-Varna. International air travellers rely on the airport in Chișinău, the Moldovan capital, or the airport in Odessa, in Ukraine. Each of the districts is further divided into cities and communes. 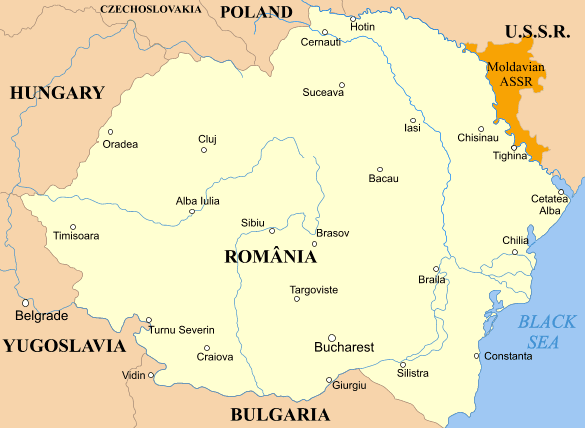 All UN member states consider Transnistria a legal part of the Republic of Moldova. Only the partially recognised states of South Ossetia, Nagorno-Karabakh, and Abkhazia have recognised Transnistria as a sovereign entity after it declared independence from Moldova in 1990 with Tiraspol as its declared capital. Between 1929 and 1940, Tiraspol functioned as the capital of the Moldavian ASSR, an autonomous republic which existed from 1924 to 1940 within the Ukrainian SSR . Although exercising no direct control over the territory of Transnistria, the Moldovan government passed the "Law on Basic Provisions of the Special Legal Status of Localities from the Left Bank of the Dniester" on 22 July 2005, which established part of Transnistria (territory of Pridnestrovian Moldavian Republic without Bender and without territories, which are under control of Moldova) as an autonomous territorial unit within the Republic of Moldova. The law was passed without any prior consultation with Transnistrian authorities, who called it a provocation and have since ignored it. Citizens of Ukraine – around 100,000 people There are around 20,000–30,000 people with dual citizenship (Moldova and Ukraine, or Russia and Ukraine) or triple citizenship (Moldova, Russia and Ukraine). They are included in the number of Ukrainian citizens. There are unsettled border issues between Transnistria and Moldova. Fifteen villages from the eleven communes of Dubăsari District, including Cocieri and Doroțcaia which geographically belong to Transnistria, have been under the control of the central government of Moldova after the involvement of local inhabitants on the side of Moldovan forces during the War of Transnistria. These villages, along with Varnița and Copanca, near Bender and Tiraspol, are claimed by the PMR. One city (Bender) and six villages on the west bank are controlled by the PMR, but are considered by Moldova as a separate municipality (Bender and village of Proteagailovca) or part of the Căușeni District (five villages in three communes). Tense situations have periodically surfaced due to these territorial disputes, such as in 2005, when Transnistrian forces entered Vasilievca, in 2006 around Varnița, and in 2007 in the Dubăsari-Cocieri area, when a confrontation between Moldovan and Transnistrian forces occurred, however without any casualties. Nina Shtanski served as Transnistria's Minister of Foreign Affairs from 2012 to 2015; Vitaly Ignatiev succeeded her as minister. PMR has a multi-party system and a unicameral parliament named the Supreme Council. Its legislature has 43 members elected by single-member district plurality. The president is elected to a five-year term by popular vote. Igor Smirnov was the President of Transnistria since the declaration of independence in 1990 for four consecutive terms. He ran for president in 2011 also, but was defeated in the first round. The majority in the Parliament of Transnistria belongs to the Renewal movement which defeated the Republic party affiliated with Igor Smirnov in 2005 and performed even better in 2010 elections. Its leader, Yevgeni Shevchuk, won the 2011 presidential elections. There is disagreement over whether elections in Transnistria are free and fair. The political regime has been described as one of "super-presidentialism". During the 2006 presidential election, the registration of opposition candidate Andrey Safonov was delayed until a few days before the vote, so that he had little time to conduct an election campaign. Some sources consider election results suspect. In 2001, in one region it was reported that Igor Smirnov collected 103.6% of the votes. The PMR government said "the government of Moldova launched a campaign aimed at convincing international observers not to attend" an election held on 11 December 2005 – but CIS election monitors had ignored that and had declared the ballot democratic. The opposition Narodovlastie party and Power to the People movement were outlawed at the beginning of 2000 and eventually dissolved. A list published by the European Union bans travel to the EU for some members of the Transnistrian leadership. In 2007, the registration of a Social Democratic Party was allowed. This party, led by former separatist leader and member of the PMR government Andrey Safonov, allegedly favours a union with Moldova. In September 2007, the leader of the Transnistrian Communist Party, Oleg Horjan, was sentenced to a suspended sentence of 1½ years imprisonment for organising unsanctioned actions of protest. According to the 2006 referendum, carried out by the PMR government, 97.2% of the population voted in favour of "independence from Moldova and free association with Russia." EU and several other countries refused to recognise the referendum results. On 3 March 2006, Ukraine introduced new customs regulations on its border with Transnistria. Ukraine declared that it would import goods from Transnistria only with documents processed by Moldovan customs offices as part of the implementation of the joint customs protocol agreed between Ukraine and Moldova on 30 December 2005. Transnistria and Russia termed the act an "economic blockade". The United States, the European Union and OSCE approved the Ukrainian move, while Russia saw it as a means of political pressure. On 4 March, Transnistria responded by blocking the Moldovan and Ukrainian transport at the borders of Transnistria. The Transnistrian block was lifted after two weeks. However, the Moldovan/Ukrainian block remains in place, and holds up progress in status settlement negotiations between the sides. In the months after the regulations, exports from Transnistria declined drastically. Transnistria declared a "humanitarian catastrophe" in the region, while Moldova called the declaration "deliberate misinformation". Cargoes of humanitarian aid were sent from Russia in response. The 1992 cease-fire agreement between Moldova and Transnistria established a Russian peace-keeper presence in Transnistria and a 1,200 member Russian military contingent is present in Transnistria. Russian troops stationed in Moldova proper since the time of the USSR were fully withdrawn to Russia by January 1993. In April 1995 the former Soviet 14th Guards Army became the Operational Group of Russian Forces, which by the 2010s had shrunk to two battalions and no more than 1,500 troops. On 21 October 1994, Russia and Moldova signed an agreement that committed Russia to the withdrawal of the troops in three years from the date of entry into force of the agreement; this did not come into effect, however, because the Russian Duma did not ratify it. The Treaty on Conventional Armed Forces in Europe (CFE) included a paragraph about the removal of Russian troops from Moldova's territory and was introduced into the text of the OSCE Summit Declaration of Istanbul (1999) in which Russia had committed itself to pulling out its troops from Transnistria by the end of 2002. However, even after 2002, the Russian parliament did not ratify the Istanbul accords. On 19 July 2004, after it finally passed through parliament President Vladimir Putin signed the Law on the ratification of the CFE Treaty in Europe, which committed Russia to remove the heavy armaments limited by this Treaty. During 2000–2001, although the CFE Treaty was not fully ratified, to comply with it, Moscow withdrew 125 pieces of Treaty Limited Equipment (TLE) and 60 railway wagons containing ammunition from the Transnistrian region of Moldova. In 2002, Russia withdrew 3 military equipment trains (118 railway wagons) and 2 of ammunition (43 wagons) from the Transnistrian region of Moldova, and in 2003, 11 rail convoys transporting military equipment and 31 transporting ammunitions. According to the OSCE Mission to Moldova, of a total of 42,000 tons of ammunitions stored in Transnistria, 1,153 tons (3%) was transported back to Russia in 2001, 2,405 tons (6%) in 2002 and 16,573 tons (39%) in 2003. Andrei Stratan, the Minister of Foreign Affairs of Moldova stated in his speech during the 12th OSCE Ministerial Council Meeting in Sofia on 6–7 December 2004 that "The presence of Russian troops on the territory of the Republic of Moldova is against the political will of Moldovan constitutional authorities and defies the unanimously recognized international norms and principles, being qualified by Moldovan authorities as a foreign military occupation illegally deployed on the territory of the state". As of 2007 however, Russia insists that it has already fulfilled those obligations. It states the remaining troops are serving as peacekeepers authorised under the 1992 ceasefire, are not in violation of the Istanbul accords and will remain until the conflict is fully resolved. On the other hand, Moldova believes that fewer than 500 soldiers are authorised pursuant to the ceasefire and, in 2015, began to arrest and deport Russian soldiers who are part of the excess forces and attempt to use Moldovan airports. In a NATO resolution on 18 November 2008, Russia was urged to withdraw its military presence from the "Transdnestrian region of Moldova". In 2011, US Senator John McCain claimed in a visit to Moldova that Moscow is violating the territorial integrity of Moldova and Georgia and one of the "fundamental norms" of "international behavior". On 21 May 2015, the Ukrainian parliament passed a law terminating five co-operation agreements with Russia. This law effectively terminates the "Agreement on transit of Russian military units temporarily located on the territory of the Republic of Moldova through the territory of Ukraine" dated 4 December 1998. One point of access for Russian soldiers travelling to Transnistria remains Chișinău International Airport and the short overland journey from there to Tiraspol. Over the years, Moldova has largely permitted Russian officers and soldiers to transit the airport on their way to Transnistria, though at some points (for example in 2015) Chișinău has periodically blocked and deported soldiers who were not clearly identified as international peacekeepers or who have failed to give sufficient advance notice. Chișinău would likely only ever agree to the possibility of moving employees, officers, and soldiers of the peacekeeping forces. The passage of soldiers of the 14th Army would be illegal. On 27 June 2016 a new law entered in force in Transnistria, punishing actions or public statements, including through the usage of mass media, networks of information and telecommunications or internet, expressing disrespect for the peace-keeping mission of the Russian Army in the Transnistrian Moldovan Republic or are directed to distort the positive role that the Russian Army had here. The punishment is up to 3 years of jail for ordinary people or up to 7 years of jail if the crime was committed by a person of responsibility or a group of persons by prior agreement. In October 2015, Transnistrian authorities organised a separate census from the 2014 Moldovan Census. According to the 2015 Census, the population of the region was 475,665, a 14.3% decrease from the figure recorded at the 2004 census. The urbanization rate was 69.9%. In 2004, Transnistrian authorities organised a separate census from the 2004 Moldovan Census. As per 2004 census, in the areas controlled by the PMR government, there were 555,347 people, including 177,785 Moldovans (32.10%) 168,678 Russians (30.35%) 160,069 Ukrainians (28.81%) 13,858 Bulgarians (2.50%) 4,096 Gagauzians (0.74%), 1,791 Poles (0.32%), 1,259 Jews (0.23%), 507 Roma (0.09%) and 27,454 others (4.94%). Of these, 439,243 lived in Transnistria itself, and 116,104 lived in localities controlled by the PMR government, but formally belonging to other districts of Moldova: the city of Bender (Tighina), the communes of Proteagailovca, Gîsca, Chițcani, Cremenciug, and the village of Roghi of commune Molovata Nouă. Moldovans were the most numerous ethnic group, representing an overall majority in the two districts in the central Transnistria (Dubăsari District, 50.15%, and Grigoriopol District, 64.83%) a 47.82% relative majority in the northern Camenca District, and a 41.52% relative majority in the southern (Slobozia District). In Rîbnița District they were a 29.90% minority, and in the city of Tiraspol, they constituted a 15.24% minority of the population. Russians were the second numerous ethnic group, representing a 41.64% relative majority in the city of Tiraspol, a 24.07% minority in Slobozia, a 19.03% minority in Dubăsari, a 17.22% minority in Râbnița, a 15.28% minority in Grigoriopol, and a 6.89% minority in Camenca. Ukrainians were the third numerous ethnic group, representing a 45.41% relative majority in the northern Rîbnița District, a 42.55% minority in Camenca, a 32.97% minority in Tiraspol, a 28.29% minority in Dubăsari, a 23.42% minority in Slobozia, and a 17.36% minority in Grigoriopol. Bulgarians were the fourth largest ethnic group in Transnistria, albeit much less numerous than the three larger ethnicities. Most Bulgarians in Transnistria are Bessarabian Bulgarians, descendants of expatriates who settled in Bessarabia in the 18th–19th century. The major centre of Bulgarians in Transnistria is the large village of Parcani (situated between the cities of Tiraspol and Bender), which had an absolute Bulgarian majority and a total population of around 10,000. In Bender (Tighina) and the other non-Transnistria localities under PMR control, ethnic Russians represented a 43.43% relative majority, followed by Moldovans at 26.15%, Ukrainians at 17.08%, Bulgarians at 2.89%, Gagauzians at 1.03%, Jews at 0.34%, Poles at 0.17%, Roma at 0.13%, and others at 7.78%. At the census of 1989, the population was 679,000 (including all the localities in the security zone, even those under Moldovan control). The ethnic composition of the region has been unstable in recent history, with the most notable change being the decreasing share of Moldovan and Jewish population segments and increase of the Russian. For example, the percentage of Russians grew from 13.7% in 1926 to 25.5% in 1989 and further to 30.4% in 2004, while the Moldovan population decreased from 44.1% in 1926 to 39.9% in 1989 and 31.9% in 2004. Only the proportion of Ukrainians remained reasonably stable – 27.2% in 1926, 28.3% in 1989 and 28.8 in 2004. PMR official statistics show that 91 percent of the Transnistrian population adhere to Eastern Orthodox Christianity, with 4 percent adhering to Roman Catholicism. Roman Catholics are mainly located in Northern Transnistria, where a notable Polish minority is living. Transnistria's government has supported the restoration and construction of new orthodox churches. It affirms that the republic has freedom of religion and states that 114 religious beliefs and congregations are officially registered. However, as recently as 2005, registration hurdles were met with by some religious groups, notably the Jehovah's Witnesses. In 2007, the US-based Christian Broadcasting Network denounced the persecution of Protestants in Transnistria. Transnistria has a mixed economy. Following a large scale privatisation process in the late 90s, most of the companies in Transnistria are now privately owned. The economy is based on a mix of heavy industry (steel production), electricity production, and manufacturing (textile production), which together account for about 80% of the total industrial output. Transnistria has its own central bank, the Transnistrian Republican Bank, which issues Transnistrian currency, the Transnistrian ruble. It is convertible at a freely floating exchange rate but only in Transnistria. Transnistria's economy is frequently described as dependent on contraband and gunrunning, with some labelling it a mafia state. These allegations are denied by the Transnistrian government, and sometimes downplayed by the officials of Russia and Ukraine. After World War II, Transnistria was heavily industrialised, to the point that, in 1990, it was responsible for 40% of Moldova's GDP and 90% of its electricity, although it accounted for only 17% of Moldova's population. After the collapse of the Soviet Union, Transnistria wanted to return to a "Brezhnev-style planned economy". However, several years later, it decided to head toward a market economy. According to the government of Transnistria, the 2007 GDP was 6789 mln Transnistrian roubles (appx US$799 million) and the GDP per capita was about US$1,500. The GDP increased by 11.1% and inflation rate was 19.3% with the GDP per capita now being $2.140 higher than Moldova's GDP per capita which is $2.040. Transnistria's government budget for 2007 was US$246 million, with an estimated deficit of about US$100 million which the government planned to cover with income from privatisations. Budget for 2008 is US$331 million, with an estimated deficit of about US$80 million. In 2004, Transnistria had debts of US$1.2 billion (two-thirds of which are with Russia) which was per capita about six times higher than in Moldova (without Transnistria). In March 2007 the debt to Gazprom for the acquisition of natural gas has increased to US$1.3 billion. On 22 March 2007 Gazprom sold Transnistria's gas debt to the Russian businessman Alisher Usmanov, who controls Moldova Steel Works, the largest enterprise in Transnistria. Transnistria's president Igor Smirnov has announced that Transnistria will not pay its gas debt because "Transdnistria has no legal debt [to Gazprom]". In November 2007, the total debt of Transnistria's public sector was up to US$1.64 billion. According to a 2007 interview with Yevgeny Shevchuk, the then-speaker of the Transnistrian Supreme Council, Transnistria is in a difficult economic situation. Despite a 30% tax increase in 2007, the pension fund is still lacking money and emergency measures must be taken. However, Shevchuk mentioned that the situation is not hopeless and it cannot be considered a crisis, as a crisis means three-month delays in payment of pensions and salaries. In 2006, the Transnistrian Republican Bank reported exports of US$422.0 million and imports of US$738.4 million. Compared to 2005, export decreased 27.2% and import decreased 13.7%. The trade deficit reached US$316.3 million. Over 50% of the export went to the CIS, mainly to Russia, but also to Belarus, Ukraine, and Moldova (whom Transnistrian authorities consider foreign). Main non-CIS markets for the Transnistrian goods were Italy, Egypt, Greece, Romania, and Germany. The CIS accounted for over 60% of the imports, while the share of the EU was about 23%. The main imports were non-precious metals, food products and electricity. After Moldova signed the Association Agreement with EU in 2014, Transnistria, being de jure part of Moldova enjoyed the tariff-free exports to the EU. As a result, in 2015, 27% of Transnistria's US$189 million export went to the EU, while exports to Russia went down to 7.7%. This shift towards the EU market continued to grow in 2016. The leading industry is steel, due to the Moldova Steel Works (part of the Russian Metalloinvest holding) in Rîbnița, which accounts for about 60% of the budget revenue of Transnistria. The largest company in the textile industry is Tirotex, which claims to be the second largest textile company in Europe. The energy sector is dominated by Russian companies. The largest power company Moldavskaya GRES (Kuchurgan power station) which is in Dnestrovsc and owned by Inter RAO UES, and the gas transmission and distribution company Tiraspoltransgas is probably controlled by Gazprom, although Gazprom has not confirmed the ownership officially. The banking sector of Transnistria consists of 8 commercial banks, including Gazprombank. The oldest alcohol producer KVINT, located in Tiraspol, produces and exports brandy, wines and vodka. The human rights record of Transnistria has been criticised by several governments and international organisations. The 2007 Freedom in the World report, published by the US-based Freedom House, described Transnistria as a "non-free" territory, having an equally bad situation in both political rights and civil liberties. The right of citizens to change their government was restricted.... Authorities reportedly continued to use torture and arbitrary arrest and detention.... In Transnistria authorities limited freedom of speech and of the press....Authorities usually did not permit free assembly.... In the separatist region of Transnistria the authorities continued to deny registration and harassed a number of minority religions groups.... The separatist region remained a significant source and transit area for trafficking in persons.... Homosexuality was illegal, and gays and lesbians were subject to governmental and societal discrimination. There is a regular mix of modern news media in Transnistria with a number of television stations, newspapers, and radio stations. According to the Organization for Security and Co-operation in Europe (OSCE) the media climate in Transnistria is restrictive and the authorities continue a long-standing campaign to silence independent opposition voices and groups. According to a US Department of State report for 2006, "Both of the region's major newspapers were controlled by the authorities. There was one independent weekly newspaper in Bender and another in the northern city of Rîbnița.... Separatist authorities harassed independent newspapers for critical reporting of the Transnistrian regime.... Most television and radio stations and print publication were controlled by Transnistrian authorities, which largely dictated their editorial policies and finance operations. Some broadcast networks, such as the TSV television station and the INTER-FM radio station, were owned by Transnistria's largest monopoly, Sheriff, which also holds a majority in the region's legislature.... In July 2005 the Transnistrian Supreme Council amended the election code to prohibit media controlled by the Transnistrian authorities from publishing results of polls and forecasts related to elections." Public education in the Romanian language (officially called Moldovan language in Transnistria) is done using the Soviet-originated Moldovan Cyrillic alphabet. The usage of the Latin script was restricted to only 6 schools. Four of these schools were forcibly closed by the authorities, who claimed this was due to the refusal of the schools to apply for official accreditation. These schools were later registered as private schools and reopened. This process may have been accelerated by pressure from the European Union. The OSCE mission to Moldova has urged local authorities in the Transnistrian city of Rîbnița to return a confiscated building to the Moldovan Latin script school in the city. The unfinished building was nearing completion in 2004, when Transnistria took control of it during that year's school crisis. In November 2005 Ion Iovcev, the principal of a Romanian-language school in Transnistria and active advocate for human rights as well as a critic of the Transnistrian leadership, received threatening calls that he attributed to his criticism of the separatist regime. As of 2007, the armed forces and the paramilitary of Transnistria were composed of 4,500–7,500 soldiers, divided into four motorised infantry brigades in Tiraspol, Bender, Rîbnița, and Dubăsari. They have 18 tanks, 107 armoured personnel carriers, 73 field guns, 46 anti-aircraft installations, and 173 tank destroyer units. The air force is composed of 9 Mi-8T helicopters, 6 Mi-24 helicopters, 2 Mi-2 helicopters, and several fixed-wing aircraft, including, An-2, An-26 and Yak-18 types. Following the collapse of the former Soviet Union, the Russian 14th Army left 40,000 tonnes of weaponry and ammunition in Transnistria. In later years there were concerns that the Transnistrian authorities would try to sell these stocks internationally, and intense pressure was applied to have these removed by the Russian Federation. In 2000 and 2001, the Russian Federation withdrew by rail, 141 self-propelled artillery pieces and other armoured vehicles and destroyed locally, 108 T-64 tanks and 139 other pieces of military equipment limited by the Treaty on Conventional Armed Forces in Europe (CFE). During 2002 and 2003 Russian military officials destroyed a further 51 armoured vehicles, all of which were types not limited by the CFE Treaty. The OSCE also observed and verified the withdrawal of 48 trains with military equipment and ammunition in 2003. However, no further withdrawal activities have taken place since March 2004 and a further 20,000 tons of ammunition, as well as some remaining military equipment are still to be removed. In the autumn of 2006, the Transnistrian leadership agreed to let an OSCE inspectorate examine the munitions and further access was agreed moving forward. Recent weapons inspections were permitted by Transnistria and conducted by the OSCE. The onus of responsibility rests on the Russian Federation to remove the rest of the supplies. Transnistrian authorities declared that they are not involved in the manufacture or export of weapons. OSCE and European Union officials stated in 2005 that there is no evidence that Transnistria "has ever trafficked arms or nuclear material" and much of the alarm is due to the Moldovan government's attempts to pressure Transnistria. In 2007, foreign experts working on behalf of the United Nations said that the historically low levels of transparency and continued denial of full investigations to international monitors have reinforced negative perceptions of the Transnistrian government, although recent co-operation by Transnistrian authorities may have reflected a shift in the attitude of Transnistria. Their report stated that the evidence for the illicit production and trafficking of weapons into and from Transnistria, has in the past been exaggerated, although the trafficking of light weapons is likely to have occurred before 2001 (the last year when export data showed US$900,000 worth of 'weapons, munitions, their parts and accessories' exported from Transnistria). The report also states that the same holds true for the production of such weapons, which is likely to have been carried out in the 1990s, primarily to equip Transnistrian forces. The OSCE mission spokesman Claus Neukirch spoke about this situation: "There is often talk about sale of armaments from Transnistria, but there is no convincing evidence." In 2010, Viktor Kryzhanovskyi, Ukraine's special envoy on Transnistria, stated that there was no ongoing arms trafficking or drug trafficking through the Transnistrian section of the Ukrainian-Moldovan border at the time.